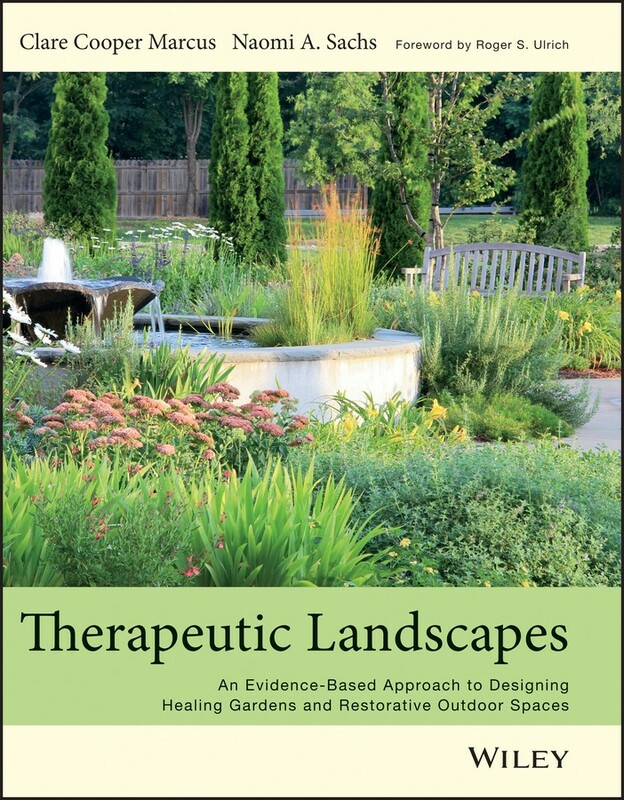 The most impressive book I have read in 2014 on the restorative and therapeutic power of nature is by Naomi Sachs and Clare Cooper Marcus titled: Therapeutic Landscapes: An Evidence Based Approach to Designing Healing Gardens and Restorative Outdoor Spaces. This book is the first on the topic published since 1999, and fills a critical gap, addressing emerging issues such as sustainability; the participatory design process; restorative spaces in public places; and gardens for veterans and active duty military personnel with traumatic brain injury (TBI) and post-traumatic stress disorder (PTSD). The beauty of this book is that it can benefit those dipping their toes in this subject for the first time, or for more experienced researchers and practitioners looking to advance their knowledge base. This really is a wonderful handbook for healthcare organizations on how to incorporate nature into their patient settings. The demand for this type of expertise will only become more prevalent as additional, more natural and holistic methods for promoting healing are sought, and government demands for efficiency and accountability in the healthcare setting increase. Marcus and Sachs cite a substantial array of research on the links between nature and health. Chapters focus on designing therapeutic gardens for specific populations such as veterans, mental and behavioral health facilities, the elderly and children. There is also a chapter dedicated to funding the development of gardens and the business case for having them. This book is very impressive and includes over 300 visual illustrations that make it appealing. I highly recommend this book as an authoritative resource on the therapeutic use of landscapes and nature. It should be required reading at all healthcare facilities as they prioritize how to utilize scarce resources in ways that have the greatest impact on patient health and healing, and for any class delving into the study of how nature can impact human health.